"The true test of defenses is watching a team respond during a period of heightened stress." A key component of DDoS preparedness is the ability of an organization to respond in an effective and efficient manner during a crisis. To do this, organizations typically create emergency response plans or similar procedures that are activated during a crisis. Despite having a plan in place, there are often lingering concerns that can only be assessed through "War Game" or "Red Team" scenarios. Will the emergency response plan be activated? Is the emergency response plan effective at mitigating the emergency? Is the response team properly trained and have necessary tools to respond? How does the response team perform under the stress of a real emergency? // Surprise Attacks: Critical to a Red Team or War Game scenario is the unannounced or surprise nature of the testing. 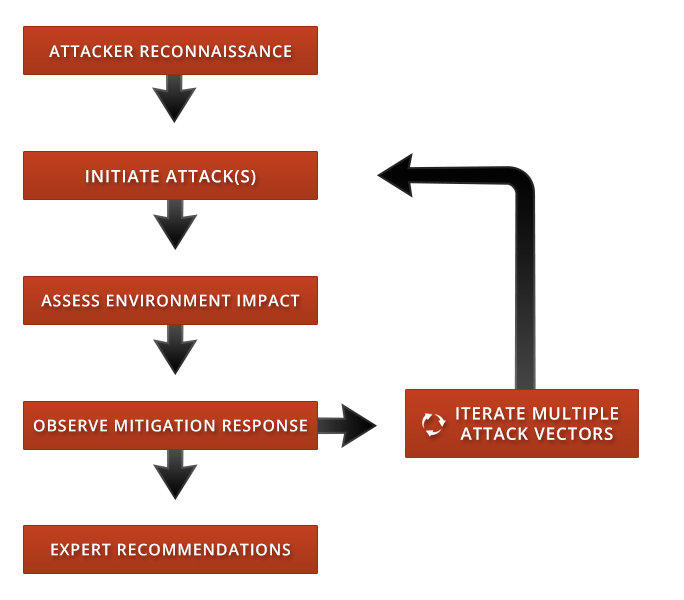 By limiting information about the timing and specific attack vector being used, a true response can be observed. To the participants the attack is real. // Process Effectiveness: Emergency response plans are often created based upon assumptions and hypothetical scenarios due to the difficulty of simulating an emergency. Using the NimbusDDOS attack simulation platform organization can become proactive by creating an "emergency" in a controlled manner. This is an ideal setting for assessing response plans. // Team Effectiveness: During stressful situations team cohesion can breakdown resulting in reduced effectiveness. War Game scenarios can help to understand this complex behavior by creating a realistic setting. // Training Opportunity: War Game and Red Team scenarios can also function as a realistic training scenario for IT teams. Rather than learning through course work, the team is presented with a real-world attack and tasked with troubleshooting and mitigating it fully. This can be further enhanced through active Q&A with NimbusDDOS experts during the scenario. // Proactive: DDoS War Games and Red Team testing are a proactive approach to managing DDoS risk. By using a controlled, yet realistic setting, organizations can get ahead of the attackers and take control of their defenses.